The biggest disaster in the history of the US economy was the Great Depression, well into the Fed's watch. The 2008 financial crisis was caused, in large part, by mal-investment encouraged by Fed action and was the latest in a string of greater and greater downturns in the economy. While the dollar essentially kept its value before the advent of the Fed, today's dollar can buy a little less than what a nickel could purchase in 1913. Debt is over $17 Trillion and is going up every minute with no sign of abatement. Interest rates have been artificially maintained at a low level once again, guaranteeing another market bubble will pop that will likely be greater than the one in 2008. Here are a couple of graphs showing the value of the dollar over the entire history of our country. Notice what caused the drop in value as the years progress. 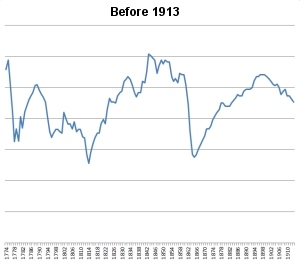 Before 1913, the value of the dollar fluctuated based on wars. The Revolution, the War of 1812, the Civil War, are all easily identified. Each time, the dollar recovered. But what about after the Fed was established in 1913? 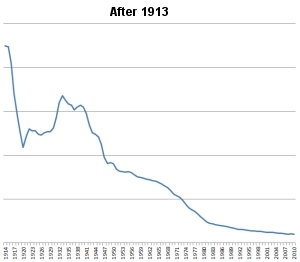 You can see WWI with a modest but incomplete recovery and WWII with no recovery at all. Because the government began printing money to satisfy bankers and politicians, the recovery of the value of the dollar has not happened. This is clear evidence that demonstrates the fraud and theft of American wealth that has been propagated on us by our government through the mechanism of the Fed. The Federal Reserve must be stopped.